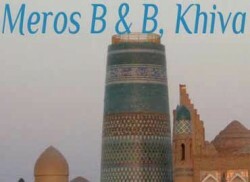 The Meros B & B is located inside the baked mud walls of ancient Khiva, not far from the western gate. Meros means 'cultural heritage' in English, and the Matkarimov family is steeped in Uzbek culture.Their great-great grandfather was a master artisan ('usto' in Uzbek) engaged by the Khivan Khans. Sadulla Matkarimov, father of the owner, worked for more than 20 years on the restoration of Khiva during Soviet times.